Have You Had Enough Of Nuggets & Chips? Nuggets and chips, fish and chips…are we the only ones who think that the options on kid’s menus in many pubs and cafes lack colour, variety, and nutritional content? A sugary juice box, soft drink or scoop of vanilla ice cream to top off the meal just doesn’t cut it. You’d think with all the knowledge around healthy eating these days, and the importance of getting children into healthy habits to combat the growing obesity problem, that there’d be better options in the way of kid’s meals when eating out. We think its time for change! Did you know, the City of Davis, California, last year passed an ordinance requiring all restaurants with kid’s meals to replace soft drinks and juice with water and milk? If parents want a sugary drink for their child- they now have to specifically ask for one. On the British High Street, a survey by the Soil Association highlighted the “almost impossible” nature of children being able to eat healthily due to the high sugar content and the lack of information given about ingredients and their origins. It pushed to the forefront the question of whether there should be a separate kid’s menu at all- why should children be left out of the colour and variety of menus that adults enjoy? Whilst many school cafeterias and tuck-shops are now tightly regulated (and rightly so), we think it’s high time pubs and cafes upped their nutrition game. Dietitian Gemma Cosgriff shared her tips on how to make the healthiest choices possible when choosing from a less than imaginative kid’s menu. Burgers: When faced with burgers, Cosgriff says you’re pretty in the clear when faced with a bun, a few bits of salad and quality mince meat. It’s the add ons: cheese, sauces, fried bacon, creamy sauces- that take it to the unhealthy zone, so avoid those. Ask if you can have the meat grilled, poached or pan fried. Beware of Fish and Nuggets: Fish cuts used in fried fish are often cheaper, possibly unsustainable kinds and the chicken in nuggets is usually the off-cuts processed together. Ask for the fish to be grilled or steamed instead of deep friend. But if you can’t avoid the crispy stuff, order a portion of veggies or salad (with dressing on the side) to make up for it. If The Menu Is Totally Poor: Ask if you can adapt something from the adult’s menu like a smaller portion of chicken and veggies, or even pasta with vegetables. Do Try: Restaurants with share plates and tapas style food! There’s more variety and you can make your children up a little plate of what you think is best. All is not lost! Although they are not in the abundance we would like, there are still some great cafes and restaurants in Sydney where kid’s menus are far from disappointing. 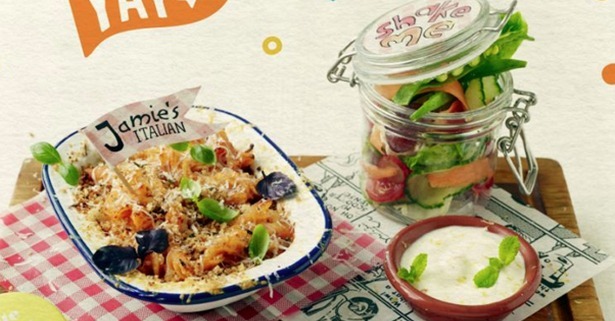 Jamie’s Italian, CBD: The kids menu offers ‘little kids’ and ‘big kids’ portion sizes. It includes nutritional options such as fresh king salmon with green beans and cherry tomatoes, free-range chicken wraps with salad, seven vegetable spaghetti and meatballs & pasture raised beef burgers in seeded buns with salad and lemony yoghurt dressing. Hide and Seek Cafe, Leichhardt: Hide & Seek is a brand new cafe in Leichhardt that’s on a mission to encourage healthy eating from a young age. 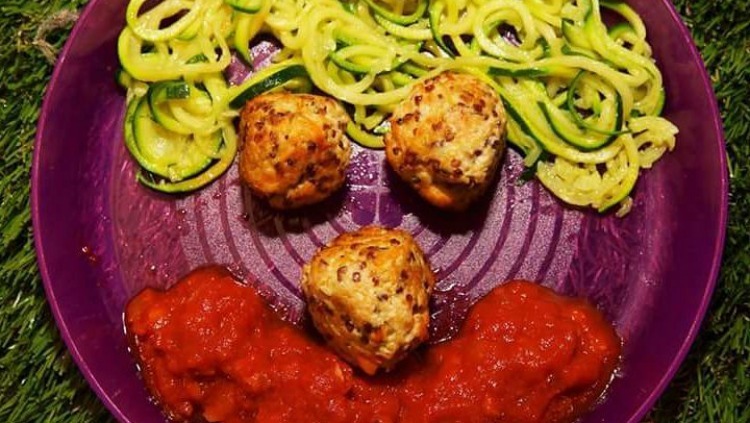 We’re gonna love their Chicken Meatball and Zucchini Spaghetti lovingly arranged in a smiley face! Grandma’s At McEvoy: Come to Alexandra for the ultimate family friendly cafe where your children are treated (and fed) like royalty. The kids menu looks like mum and dads’, however the portions are smaller. When we dined there recently, Mr. 2 just adored dipping his turmeric bread into his Shakshuka. They also host FREE cooking classes, teaching children the importance and appreciation of food. Daniel San, Manly: Although their ‘Karate Kids’ Menu isn’t extensive, we applaud their new and exciting options for kids to try. They can have a Maki Roll with their choice of cooked tuna, avocado or cucumber filling, Japanese sausages with corn and broccoli or steamed fish with corn and broccoli. Not too shabby. Ooooooh YES!!!! DD is 5 and DS is 2.5. I TOTALLY agree with this article! We Would love to have more addresses with nice food for kids in Sydney and Inner West. We almost always ask for an adult main to be split en 2 little plates for our kids and they enjoy it. There is more choice, it's better quality, tasteful and often cheaper than ordering 2 kids menu. Only at "our place" in Balmain they will eat from the kids menu (they always order the same meal: beef Espetata, roasted corn cob, fries + ice-cream for dessert) which is good and FREE.